Sometimes a "file association" error occurs on your computer, which prevents Adobe Digital Editions (ADE) from opening downloaded ebooks. If you're having trouble opening ebooks in ADE, try the steps below to make sure that your computer opens ACSM files (which are used to download ebooks) in Adobe Digital Editions. Note: If you're using the Firefox browser, you'll also need to change the ACSM file association there (to make sure Firefox opens ACSM files with the correct program). 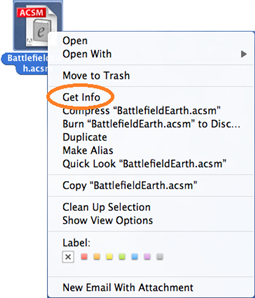 Click Start and type "Default Programs" into the search box. Press Enter. Scroll down and select the ACSM file type. 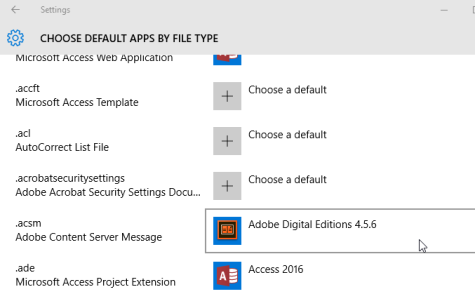 The extension should be set to "Adobe Digital Editions" under "Current Default." If this is not the case, click Change program . . . Select Adobe Digital Editions from the list of recommended programs. If it's not listed there, continue to step 6. Otherwise, skip to step 7. Click the Browse button, and select DigitalEditions from one of the locations listed at the end of this step, and click Open. Note: You can find your system type by searching for System on your computer, then selecting the System option under "Control Panel." Click OK, then close to save the changes. Use the Search charm to search for "Default Programs." Select More options (or More apps), scroll to the bottom of the list, and select Look for another app on this PC. Then, select DigitalEditions from one of the locations below. 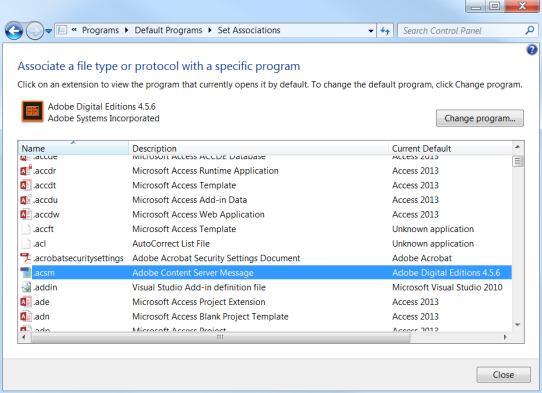 Click on the icon bottom of the screen, type "Default programs" and select the result with the icon. Click Choose default apps by file type. The extension should be set to "Adobe Digital Editions." If it's set to a different app, click on the app to view other options. Select Adobe Digital Editions from the list of recommended programs. If it's not listed there, you'll need to contact Microsoft Support. Find the ACSM file for the ebook you're trying to download (by default, it will go in your computer's Downloads folder), and control-click on it. Expand the Opens with section. Click the drop-down menu and select Adobe Digital Editions. Click Change All . . ., then Continue. Close out of the info window. If you continue to have problems with ADE, see this article for more troubleshooting options.